The short answer: they’re triangular-shaped, stuffed cookies. The long answer: they are the traditional dessert for Purim, one of the lesser known and most festive of Jewish holidays. Chanukah may have its presents, but it’s not nearly as festive as Purim. Jews of Eastern European decent (Ashkenazi) celebrate by telling the Purim story through a comic or satirical play called Purim Shpiel, using noise-makers whenever the name of Haman (more on him below) is mentioned, dressing in costume (including cross-dressing), and giving alms to the poor and gifts of hamantaschen and food to friends, neighbors, and family. But we are also supposed to eat, drink, and be merry. In fact, the Talmud requires us to drink until we cannot tell the difference between the villain and the hero of the Purim story. Actually there are two heroes of the Purim story, Mordecai and his cousin Esther, who he had raised as a daughter. The King of Persia asked Esther to become his queen without knowing she was Jewish. To protect her life, she kept her Jewish identity secret until Haman (the king’s advisor) convinced the king to execute all of the Jews. According to the story, Haman wanted the Jews killed because Jews like Mordecai refused to bow down to him. This put Queen Esther in a quandary. Should she risk her life and reveal herself as a Jew, or should she let her people die? She decided to tell the king her secret and convinced him to save the Jews and arrest Haman. When I was a child, all we did to celebrate Purim was go to the local bakery and buy hamantaschen. Since Haman habitually wore a triangular hat, hamantaschen are shaped as triangles as a way of mocking him. The bakery in my neighborhood sold hamantaschen with the three traditional fillings: prune, apricot, and muhn (poppy seed), but it also sold raspberry filled hamantaschen, which next to muhn were my favorite. Seriously, what kid wants prune? After I moved to Portland, buying hamantaschen became difficult, okay, next to impossible. For several years, we let ourselves get so busy with everyday life that it became easier to forget all about the holiday. But then I began searching for hamantaschen recipes online. 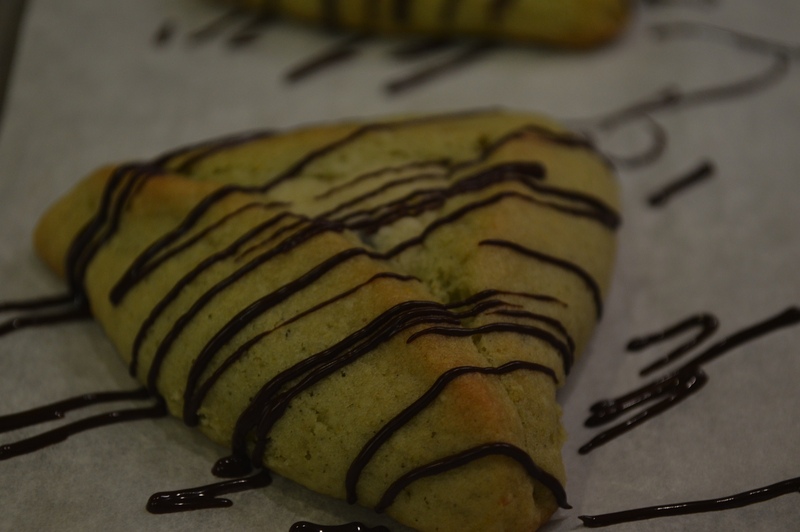 In recent years, people have gotten really creative with hamantaschen recipes, and why not? I’ve seen chocolate with Irish Cream filling, Red Velvet, and even Manishewitz hamantaschen. Now, when it comes to pastry, one of my favorite flavors is almond. So, in honor of my gluten-intolerant son and my love of almonds, I made these gluten-free and filled them with almond cream. Oh, and I added chocolate chips, since almost anything good can be made better by adding chocolate (or by frying). They were a huge success! OPTIONAL: 3 ½ oz (¾ cup) chocolate chips for decorating the hamantaschen. 1. Combine flours, xanthum gum, baking soda, and salt into a bowl. 2. In a separate bowl, cream butter and sugar until light and fluffy. 3. Add egg, zest, orange juice and Grand Marnier. Beat until smooth. 4. Add flour mixture one tablespoon at a time and mix until fully integrated. 5. Sprinkle a board with gluten-free flour and knead dough a few time until it holds together in a ball. Flatten the ball of dough into a disk. Wrap with plastic and refrigerate for at least two hours or overnight. 1. Soften butter in a mixer. 2. Add confectioners sugar and blend at a slow speed (so it doesn’t fly into your face). Once the sugar is incorporated, beat until light and fluffy. 3. Add almond flour and cornstarch and mix well. 4. Add egg and almond extract and beat on medium high speed. 3. Line a cookie sheet with parchment paper and place circles of dough on sheet. 4. Add a generous ¼ teaspoon of chilled filling to center of each circle, brush egg wash over cookie dough, and fold dough into triangles. Pinch the edges so the filling doesn’t leak when baked. 5. Brush egg wash over outside of cookie. 6. Bake 10-12 minutes at 350℉ or until golden brown. 2. Cut a square of parchment paper in half to create a triangle. Roll the triangle into a tight cone called a cornet. There are lots of videos on youtube that demonstrate this. 3. Fill the cone with the melted chocolate and roll the top closed. 4. With scissors, snip of the tip of the cone. 5. Moving back and forth quickly over the cookies, pipe strips of melted chocolate or whatever pattern you like on top of the hamantaschen. 6. Once the chocolate has set, you are ready to eat. Gail, once again, I’ve enjoyed learning from you. Thank you for tagging me on your posts. This looks and sounds wonderful, I especially agree with the frying! !